More 4 Mom: UPrinting.com 250 Flyers GIVEAWAY! Do you have a message that you want to promote? What about an upcoming fall festival, charity event or birthday? Why not get a flyer to promote your up coming event? 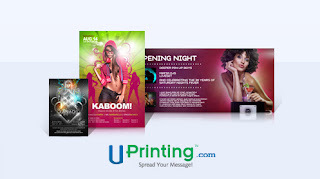 UPrinting.com offers flyer printing for all types of events. From club flyers to business printing, UPrinting offers it all. There are lots of printing companies out there, but UPrinting.com offers all types of services in one location. With short turn around times and high quality products, UPrinting.com can provide what you need. UPrinting.com has offered my readers a great giveaway. One person will will the following prize. Winners are allowed to win only once over a six-month period, for a UPrinting.com prize. This is a Rafflecopter giveaway. If there is a problem with your entry, please contact me. Disclosure: This giveaway is sponsored by UPrinting, no monetary compensation was given and I will receive flyers for hosting. For more information about flyers, please visit UPrinting.com. Fore more information on my disclosure policy, please see www.more4momsbuck.com/disclosure.